One of my favourite artists is Alphonse Mucha who created a series of star inspired paintings.He also used the most beautiful feminine colours, like deep pinks and purples in his pictures.So,with Mucha in mind I have incorporated this seasons key trends of stars and bold colours to create this necklace. 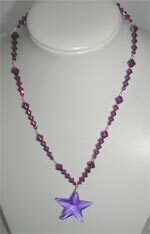 The 20" necklace is made up of linked sterling silver headpins(with clasp fastener) which each hold a graduated run of warm amethyst coloured bicone swarovski beads. 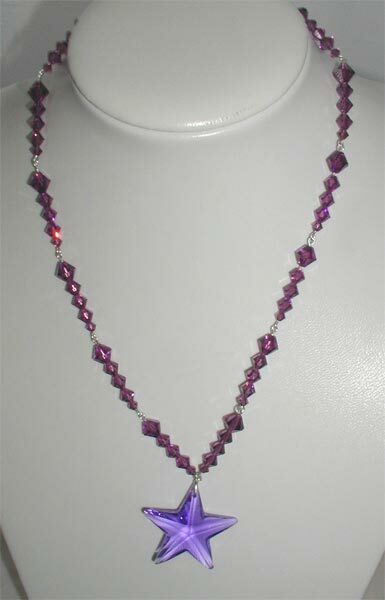 In contrast to the amethyst colour is a beautiful blue/violet 4cm swarovski star.As you can see this star mixed with the amethyst beads really shows a breathtaking contrast and makes such a statement, this necklace an ideal accessory for this seasons bold fashions and ideal to go with an evening outfit.